In my post about Taka Fischgrill Stube I mentioned the plethora of Turkish restaurants and kebab shops dotting the landscape around Kottbusser Tor in Kreuzberg. After eight years in Berlin, I think I’ve managed to eat at most of them at least once, but Doyum Grillhaus has always been, without a doubt, my absolute favorite. It used to be my well-kept secret, but since their massive expansion and renovation last year to accommodate their growing business, it’s evident I’m no longer the only person who knows about it, so I reckon its fine to put a plug in for them now. They really deserve it. 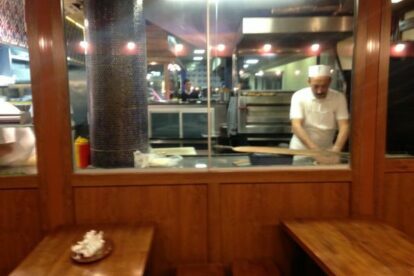 The first thing you see when approaching the beautifully tiled restaurant is a man carefully, yet swiftly hand rolling and topping lahmacun, a Turkish thin-crust pizza covered in a spicy blend of mince, herbs, onions and tomatoes, cooked down to a bolognese-like consistency. He carries out his task so naturally and mechanically, you know he has made hundreds of them every day since Doyum opened fifteen years ago. The last step is him turning around and throwing them into a hot stone oven, the sight of which lets you know this is going to an unforgettable meal. I could go on and on. I risk sounding overly dramatic, so just go to Doyum. I love ordering their lentil soup to dunk my lahmacun in. Order as much as you can off the menu. Everything is perfect. And come back the next day for more.